Stormhaven is the south-central region of High Rock. It is a prosperous place rich in fishing, farming, hunting, mining, and trading opportunities. The Bjoulsae River flows into the Iliac Bay along the coast, from which the Isle of Balfiera and its famous Adamantine Tower can be seen in the distance. The King's Guard mountain range to the west and north separate it from Glenumbra and Rivenspire, and the Wrothgarian Mountains form its border to the north and east. The western region Alcaire is home to the city of Alcaire (also called Alcaire Castle) as well as other settlements, like the port Koeglin Village. The central portion of Stormhaven, Menevia, is home to the merchant city of Wayrest. Wayrest forms part of Menevia's border to Gavaudon, the eastern region of Stormhaven. Gavaudon has no major cities of its own, only small towns like Wind Keep and Shinji's Scarp, though a bridge in the east leads directly to the city of Evermore in Bangkorai. The region is mostly populated by Bretons, along with a minority of Orcs (much to the chagrin of many of the Bretons). Goblins also inhabit the region. Stormhaven's known history begins with the Direnni, who discovered the Adamantine Tower in the Middle Merethic Era and claimed it and the surrounding area. For a time, they ruled all of modern-day High Rock, and at least part of Stormhaven was presumably part of their dominion for virtually their entire hegemony. The Direnni interbred with Nedic subjects as a matter of entertainment, and did so frequently, so frequently that the manmer which inevitably resulted from these unions were so numerous that they formed a new race, the Bretons. The Direnni were few in number, and established a hierarchical, feudal system in order to control their vast domain. The Bretons became a privileged middle class within this society. The Direnni ruled for untold generations, but following the Battle of Glenumbria Moors circa 1E 482, they lost their grip on High Rock and eventually retreated back to their tower. The Bretons merely replaced them with their own noble families and carried on, eventually joining the Alessian Empire in 1E 1029. When High Rock decided to secede in 1E 2305, Alessian forces were stalled and turned away in Bangkorai, sparing Stormhaven from their retribution. Centuries later, they joined the Second Empire and continued to prosper. 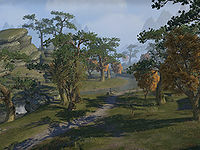 The cities of Alcaire and Wayrest, along with numerous smaller towns and keeps, make Stormhaven one of the two most populous regions of High Rock (the other being Glenumbra). While there is quite a bit of traffic between these two, Stormhaven also has significant trade and strong ties with Rivenspire to the north. Circa 2E 582, while still recovering from the devastation of Ranser's War, Stormhaven was plagued by a group of Vaermina worshippers called the Supernal Dreamers. What started in Alcaire soon spread across Stormhaven: raids, kidnappings, and pacts with daedra sent fear through the populace. The Dreamers sought to spread their influence even further and eventually converge their forces on Wayrest, and thereby plunge the entire Daggerfall Covenant into a waking nightmare. At the time, Stormhaven was also home to the Spirit Wardens, an order of Azura worshippers founded by an Orc named Durak who claimed to have received a vision of the Daedric Prince. Azura had told him to prepare for a time when the people of Stormhaven would be plunged into a madness of nightmares, and to protect Stormhaven when the time came.